DEEP PURPLE TRIBUTE - RE-MACHINED - A TRIBUTE TO DEEP PURPLE’S MACHINE HEAD (CD) | Online Shop | Wizard LTD. 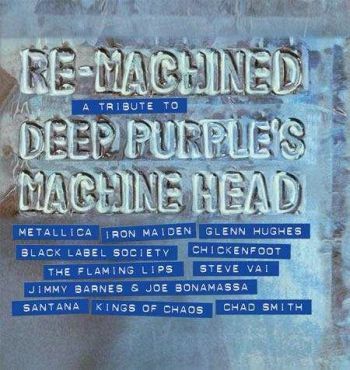 Album: "RE-MACHINED - A TRIBUTE TO DEEP PURPLE’S MACHINE HEAD (CD)"
Just as Deep Purple’s Machine Head reaches its 40th anniversary, Eagle Records has announced a forthcoming tribute album. Re-Machined – A Tribute To Deep Purple’s Machine Head is set to be released September 25 and will be filled with a hefty group of contributors. The tribute to Deep Purple’s classic 1972 album features contributions by many noteworthy acts, including The Flaming Lips, Metallica, former Deep Purple Mk III member Glenn Hughes with Chad Smith of Red Hot Chili Peppers, Iron Maiden and Steve Vai. The band’s famed “Smoke on the Water” actually appears twice on the album, featuring both The Flaming Lips and a collaboration between Carlos Santana and vocalist Jacoby Shaddix.